Despite the UK positive economic data, this currency is acting weak against the strong USD. 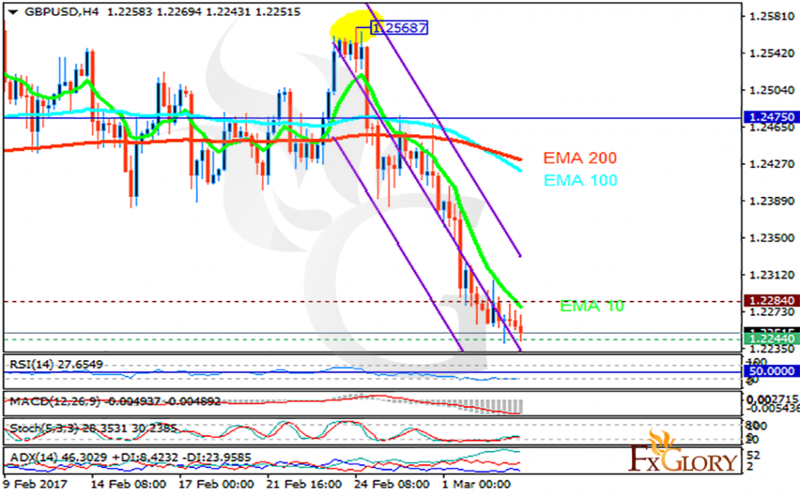 The support rests at 1.22440 with resistance at 1.22840 which both lines are below the weekly pivot point at 1.24750. The EMA of 10 is moving with bearish bias along the descendant channel and it is below the EMA of 200 and the EMA of 100. The RSI is moving in oversold area, the Stochastic is moving in low ranges and the MACD indicator is in negative territory. The ADX is showing strong buy signals. The support area seems to be strong to be broken therefore correction pattern will start soon targeting 1.23.